Palatability enhancers are used to affect taste, smell and texture of pet foods to increase their desirability to companion animals. This helps to overpower the bitter taste of vitamins, minerals and other medicines can be minimized by mixing palatability enhancers to the animal feed. It increases the intake of feed by animals. In addition, palatability enhancer increases shelf life stability to the product. Feed palatability enhancers and modifiers have gained a worthy position in the feed supplements as they are highly influential in the development of animal feed industry. Apart from minimizing the bad taste of animal feed, feed palatability enhancers and modifiers also help in improving health of livestock. Palatability is critical for manufacturers to consider when formulating a nutritionally balanced pet food. Foods for dogs and cats can be made more palatable through various means, such as an adjustment in acidity and others. High-intensity, savory-based palatines that utilize meat, marine, cheese and liver-based ingredients are used for enhancement purposes as well. Palatability enhancers can be used either as the sole palatine in a formula or also in conjunction with meat-based enhancers to provide the best value and palatability to the pet food formulator. The global market for feed palatability enhancers and modifiers is analyzed by segmenting the market into five segments including by type, by flavor, by sweeteners, by texturant and by livestock. Each of the segments is further divided into sub-segments to give a holistic view of the market. These segmentations are subsequently followed by geographical segmentation of the market by splitting the market into Americas, Europe, APAC and RoW regions. Increasing consumer awareness about quality of meat, rising demand for animal feed, rising concern of quality of pet food and rise in global meat consumption are some of the major driving factors for feed palatability enhancers and modifiers market. The Asia-Pacific is the largest and fastest growing market for feed palatability enhancers & modifiers while North America is the second largest market. These two regions are closely followed by Europe while RoW is the slowest growing market. The North American feed palatability enhancers and modifiers market is also growing rapidly due to the rising awareness of pet owners about the quality products and regarding the chemicals used in the animal feeds. 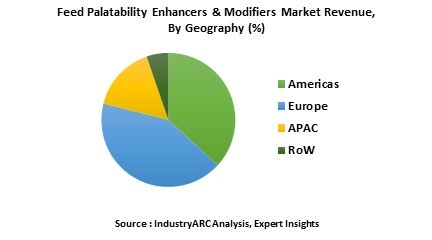 These are the major factors which drives the growth of the feed palatability enhancers and modifiers market in the region. Cattle have bad breath and commonly suffer from severe, chronic flatus generating large amounts of methane, which is a greenhouse gas [GHG] and also a driver for anthropogenic global warming. Methane is one of the most important [GHGs] and it has 21 times more global warming potential than carbon dioxide. Ruminant livestock contributes the major proportion of total agricultural emission of methane. The various approaches for reducing methane emissions from cattle and other livestock involve feed palatability enhancers & modifiers. The only way to reduce the global burden of methane emissions from livestock is change in nutrition with the help of feed palatability enhancers & modifiers. Thus feed palatability enhancers & modifiers play an important role on methane reduction by ruminants. Manipulating the diet of these animals without feed palatability enhancers & modifiers is a big challenge. 13.7. Dairy One Cooperative Inc.